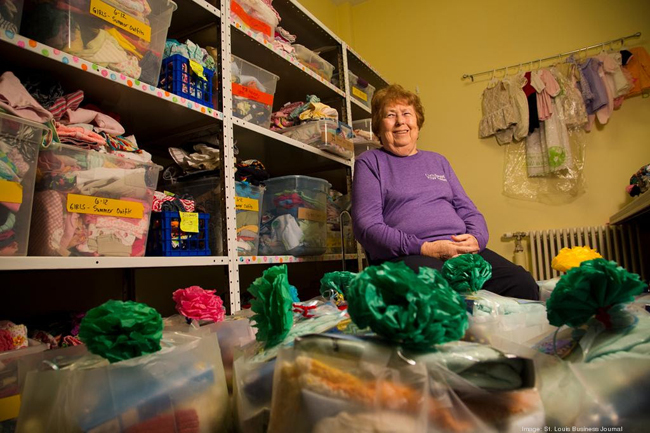 In August 2010, Alice Provaznik, a longtime volunteer at SSM Health (formerly St. Mary’s in Richmond Heights), saw a need after learning that nurses were going to garage sales to buy baby clothes, then laundering and giving them to new mothers needing assistance with basic clothing items for their new babies. Alice, a mother and grandmother, could not accept the thought of babies without clothes or blankets, so she asked family, friends, schools and members of her church to help these mothers and delivered the items to SSM Health. Over time and by word of mouth, the program grew. In-kind donations began arriving at the volunteer office at SSM Health and also on Alice’s front porch with enough clothes donated to ensure that each ‘sweet baby’ would receive something. Over time, the program has grown, and the “Sweet Babies bag” now consists of over 30 items of clothing, ranging in sizes from 0-3 months up to 12 months, hats, socks, bibs, burp cloths, receiving and baby blankets, books, 60 diapers, a small package of baby wipes, and something warm to wear. The number of families helped has grown from around 10 per month in 2010 to approximately 70 per month now. Sweet Babies is active in recycling and many of the clothes donated come from closets, dresser drawers and various thrift stores. Sweet Babies also loves to receive donations of hand-made items, either knitted, crocheted or sewn. Alice, our founder, is proud that Sweet Babies recycles so many clothes and is appreciative to receive such beautifully crafted handmade items including hats, booties, bibs, burp cloths, blankets, and knitted or crochet sweaters.